These cute individual gluten-free apple pies are a snap to make! 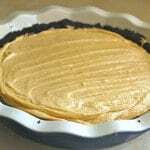 You sandwich apple pie filling between two pieces of gluten-free pie dough, crimp with a fork, and bake. If you feel like it, brush the top with a beaten egg and sprinkle on a little coarse sugar. The crunch of the sugar adds a nice touch to these adorable pies. The best part? You don’t need to invest in mini pie pans to make these handheld treats! One of the awesome benefits of living in upstate New York is that I’m sitting right in the heart of New York’s apple country. There are dozens of fantastic orchards just a few miles from our home. And, around here, the fall apple crop is big news. How big? A few years ago, the front page of my carried this headline: “Slim pickings for area’s apple crop.” The combination of warm March temperatures and an April freeze led to a poor apple-growing season and early fall apples. How early? Some pick-your-own-orchards opened in early August that year! August! Not wanting to miss the apple crop, I did what any apple-loving baker would do. I made pie. In August. Which, let me tell you, just felt weird. 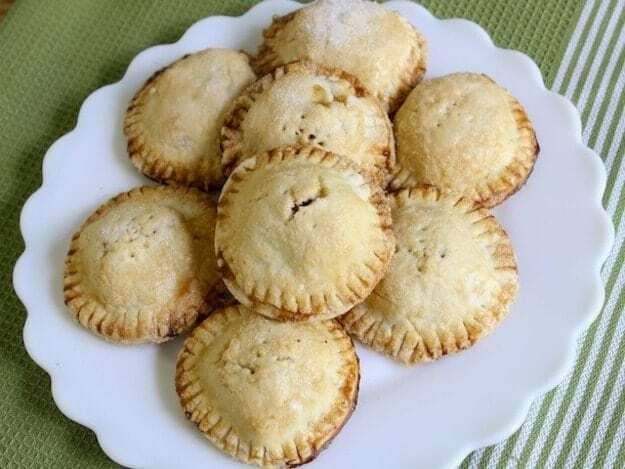 Instead of baking a traditional pie, I decided to make individual gluten-free apple pies since the petite size makes them easy to enjoy while dining outdoors–as we tend to do in August. And, thus, a new tradition was born! Ever since, I’ve made individual gluten-free apple pies in the fall. Even when the apple crop is awesome, as it was this year! 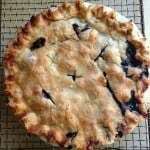 Back when I was baking with wheat, individual pies were especially fun to make. 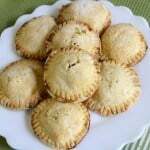 You simply took a round of pie dough, plopped in some apple filling, and folded the dough over the filling. The gluten-free pies, however, weren’t as fun or easy to make at first. Finally I ditched the idea of a turnover. I grabbed two round cutters, cut dough rounds, filled them, and attempted to seal the dough. Again the top piece of dough tore as it went over the chunky filling. This time, there was an easy solution to the problem: use a larger cutter for the top pastry. The slightly larger piece of dough covers the filling easily. No tugging required! This simple adjustment again made it easy to make individual pies. Who knew that such a sweet tradition would be born from such a bad apple season? You need two round cookie cutters to make these individual gluten-free apple pies, one slightly larger than the other. 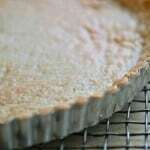 One 3-inch and one 3 1/2-inch cutter make the perfect bottom and top for the crust. Be sure to use the larger cutter for the top crust. 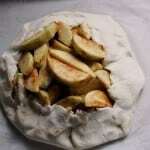 This allows it to easily drape over the apple filling without tearing. Hi! Can you use a rice flour blend instead of making it from scratch? If so, how much would I use? It has the tapioca and xanthan in it already. Yes, replace all the flours and starches with your favorite blend. Enjoy!